Seeing as this is my third Rhythm Traveler (hereafter referred to as “RT”), I’m obviously biased toward these drums. However, every possible attempt will be made to keep this review unbiased and “matter-of-factly”. My first RTs were purchased largely based on the inclusion of mesh heads and plastic cymbals for silent practice as I lived in a condo at the time. When I moved to a house the RTs received the mylar heads and real cymbals and jammed that way for about a year. They were later sold to finance a used full size drum set. Even with the available space, I found that I missed the RTs and ended up buying another set. A couple of years later, Due to expecting a baby, both the RT and the full size set were sold and replaced with an electronic kit. By the time my daughter was three I once again set out to acquire an acoustic drum set and decided on yet another RT in black, just like the previous two, which will be the subject of this review. The RTs come neatly packaged in two boxes that easily fit an a sub-compact hatchback. I unpacked them at the store so as to not have to dispose of all the packaging and dropped off the CX300 cymbals at the thrift store on my way home. Not that the included cymbals are any worse than cymbals included with other entry level sets. In fact they’ll do the job of filling the stands nicely if this is a first kit. However just like any included budget cymbals, they always made me feel like a cartoon character when I attempted to crash the “crash/ride”. The hats sound acceptable closed but not so acceptable open. Hardware: Chrome cymbal stand, Chrome Hi-Hat stand with black base, Three black L-arms, Two black bass drum spurs, Aluminum clamp for mounting the low tom to the cymbal stand, Aluminum/black bass drum pedal, Chrome snare stand, Two sided beater (Felt/plastic), Two 20″ Black anodized aluminum hoops with black wrap inlay, 10″, 12″, 14″ black rims and the two 13″ black rims already assembled on the snare, 12 black claws for the bass drum and a bag of chrome T-rods. Heads: Black 20″ rez head with white pearl logo, Clear 20″ batter head with integrated “o-ring”, 10″, 12″ and 14″ “Pearl Protone” dual ply hydraulic (oil filled) tom batter heads as well as the coated 13″ batter head and clear 13″ rez head already assembled on the snare. Also included is a complete set of batter-side mesh heads for each drum. 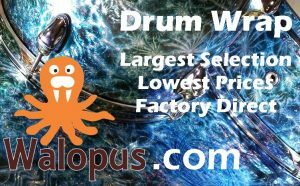 Drums: The overall quality, fit and finish is in my opinion excellent for the price-range. The tolerances vary so I will list them separately per drum, in this order; Trueness of Bearing Edge (How “out-of-flat” the bearing edge is); “Out of roundness”; Bearing edge finish and Rim/hoop “Out of flatness”. In this price range I would expect up to 1mm Out-of-flat, and up to 3mm Out-of round. The snare bed is perfect. Not over-exaggerated which is so common in recent years. (Going back some 10 years or so they used to be missing altogether on budget snare drums.) Rather it’s a gentle taper on both sides sloping down to a depth of a couple of millimetres with a width about an inch and a half. Snare beds like this are rarely seen on any snare included with a kit. Extra points to Pearl. According to my own standards the Out-of-flatness for the snare and 14″ tom are a bit on the high side but still in the expected range. However, the consequence of excessive “out-of-flatness” is generally an inability to tune them correctly or a lot of effort and/or higher than normal tuning required to tune them equally around the rim. One would expect that this would be amplified by the snare only having six lugs per side. My tuning tests though revealed the opposite, they all tune very easily even at low tension. I had no issues quickly tuning them by ear at a very modest torque of six Kg/cm. On the 14″ tom, the dual ply hydraulic heads may play a role in this, but I’m baffled that the snare tuned so easily with a regular coated head. I believe the wrap is only adhered at the leading and trailing edge, but nicely tightened to the point that they shouldn’t have any noticeable choking effect on the sound. The insides of the shells are sanded to a smooth, but not glossy finish and the mahogany (Lauan?) has a pleasing wood grain. If the outside under the wrap is as nice, they would make nice candidates for a re-finish. Something that quite a few people have done. The tom brackets are standard 7/8″ “poke the arm into the drum” type and the bass drum spur brackets are hinged. The spurs themselves are simple but do the job nicely and feature spikes as well as rubber feet. The older generations didn’t have the spikes causing bass drum creep. All the metal parts are of consistently higher quality than expected in this price range. The lugs really shine, as they are small, light and spring-less. Hardware: The snare stand and cymbal stand both seem suspiciously light duty but have proven to be both sturdy and durable (Comparably speaking) while being nimble and light. The high hat stand, also light and nimble, seemed “sluggish” at first, but I’ve either gotten used to it, or it’s loosened up with some use. While I can’t say there’s anything wrong with the bass pedal, it never felt quite right to me either. All three RTs I’ve owned came with the same pedal and in all three cases it’s gotten replaced with just about any other pedal. This may very well be just my personal preference though. It’s well constructed and of decent quality, just never felt right to me. All the other included hardware is either of expected or better than expected quality and finish for the price range. Heads: One of the first things to get replaced on most kits are the heads. This is sometimes due to horrible heads supplied from the manufacturer or personal preference. In my sometimes not so humble opinion the included heads, especially on the toms, are a perfect match for the kit. The dual ply hydraulic heads seem to substantially lessen the timbale effect otherwise common with small single headed toms and instead provide a satisfying thud-like sound. Same for the batter side bass drum head. The coated head on the snare is satisfactory but definitely not ideal and would likely be the first candidate for replacement. 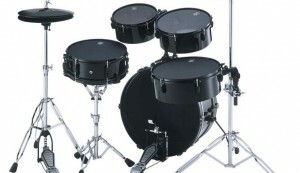 As mentioned the RT comes with a complete set of batter side mesh heads as well as plastic cymbals with foam dampers. The “Muffle Heads” are single ply and of high quality. 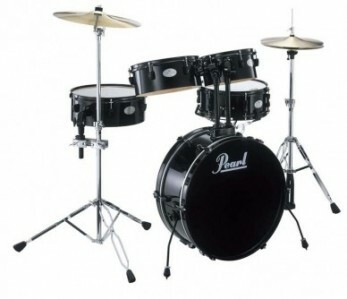 they are commonly used for conversion of electronic drum kits with mylar heads due largely to their competitive pricing and general availability. The RT really shines in this configuration. There is just enough drum sound to satisfy your senses while being so near silent that you could practice in the next room as someone sleeping without disturbing them at all. Even the snare responds with a slight vibration of the rez head. Just enough to set the snares in motion. Disregarding the stands and hardware which of course is the same as for a regular kit, the RT is easily disassembled in a matter of minutes and the entire shell-pack fits in the front passenger seat. The snare and toms all fit nicely into a single soft-case for a 15″ tom facilitating a single trip to and from the car. With the correct use of memory locks, set-up is also done in a matter of minutes. Considering this is a five-piece kit with a 20″ bass drum, I would say that portability, set-up and tear-down of the RT is as optimal as it gets. Obviously, this section is largely subjective and you may not agree with me. I would recommend listening to the RT in person before making any decisions to purchase one. The bass drum sounds much larger than it’s diminutive size and shallow depth suggests. It will gladly tune lower than you’d expect from a 20″ with only six lugs per side and without any modifications will ring out for minutes. Cut a CD size hole in it, tune it up a bit and drop a towel inside and you’ll swear you’re playing a regular 22X18, albeit a tad quieter. The toms obviously can never sound like dual headed ones but as far as concert toms go, they sound as good as any I’ve heard and again will gladly tune lower than expected fooling the ears that they are larger than their actual size. The snare, while not having a large range and won’t provide a real snappy crack, has an overall pleasing tone that surpasses many snares almost the price of the entire RT. Overall for the price and considering the many compromises made in the interest of portability, the RT sounds far better than would be expected. 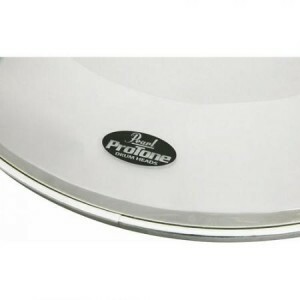 Sealing and clear-coating the inside of the snare drum shell would greatly improve both the tone and “crack”. Tung-oil would be the simplest product to use and acts as both a sealer and clear coat in one. Apply three to four coats. Make sure to mask the bearing edges. Stuffing the L-arms with foam and capping the ends reduces interference with the drums primary tones. Capping can be done with a piece of dowel, a plastic cap, or silicone. The RT is more than fair value for money and has far more pros than cons. The biggest cons being the tolerances on some of the shells, the bass pedal and the fact that they, contrary to the manufacturers website, don’t exactly nest, unless you remove a bass head. (The 10 will fit in the 14 with the 12 sorta’ acting as a lid.) The pros however far outweigh the few cons. Personality and conversation piece is an added bonus. 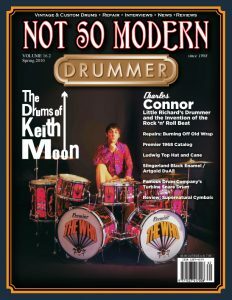 Pearl’s Rhythm Traveler gets the CompactDrums.com stamp of approval.